The Bengal, self defined independent voice for the Idaho State University community has posted a interesting article about Dr. Jeff Meldrum. Dr. Meldrum is an Associate Professor of Anatomy and Anthropology in the biology department at Idaho State University. 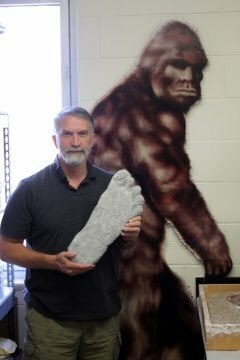 The article reveals Dr. Meldrum's unique perspective when it comes to analyzing footprints based on his research on early hominids. Meldrum also said the case of Sasquatch is particularly interesting to him because his background is in the evolution of human locomotion. He said, "The proposition of another biped – perhaps an early hominid or an ape – that had evolved the same bipedal adaptation as humans is an intriguing question. "I was already familiar with footprint evidence for early humans walking, so I recognized features and possibilities attributed to Sasquatch. "I thought I could make a significant contribution to the resolution to this issue from the perspective of systematic evaluation of footprint evidence because I'm very familiar with that type of data. "So I started collecting as many examples of the footprints as I could." The article continues with Meldrum's Journeys to China.